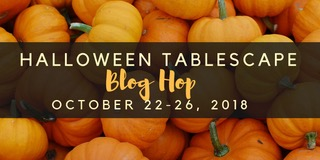 I'm thrilled to be joining Chloe at Celebrate and Decorate for this fun Halloween Tablespace Blog Hop! I wasn't planning on doing Halloween décor this year but as soon as I stared setting up some of the spiders, bats and rats...….oh my! The kids were filled with excitement! I think even more than Christmas décor! 🤣 When my older boys were younger they loved Halloween! My oldest especially, the creepier the better! I was always a little worried by how much he liked the scary stuff but it did eventually wear off. Thank goodness, but most of my Halloween décor is creepy. I went into this setting not wanting to buy anything and I love vintage Victorian style décor. 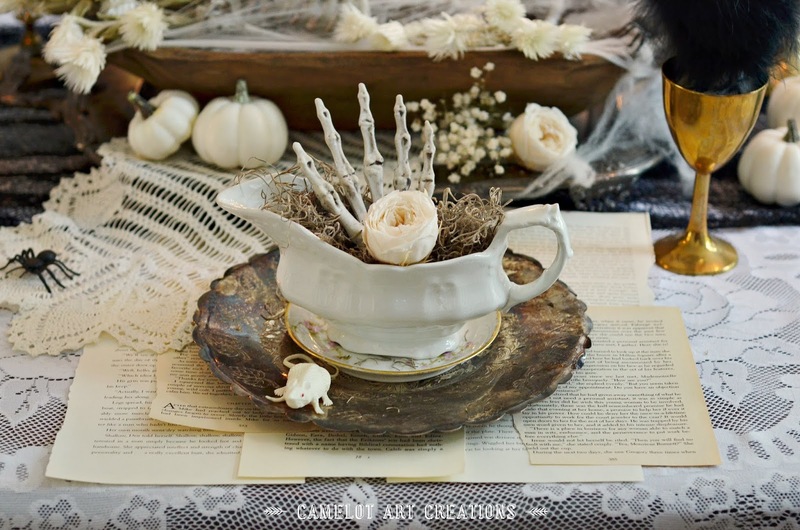 I had to think out of the box a little on this one and went with a little creepy and a little vintage using some of my antique dishes. It's more of a playful style by mix & matching dishes and a sprawling centerpiece. I didn't buy anything!! My husband was happy! As we were pulling stuff out of the Halloween bins and setting it in a big pile on the table, my son put the broken skeleton in my dough bowl because there was no more room on the table. LIGHTBULB! He fit perfectly in the dough bowl and we went into the creepy side of Halloween from there! !🤣 To fill some of the space in the bowl I used dried flowers from Afloral.com and spider webs for a old coffin look. 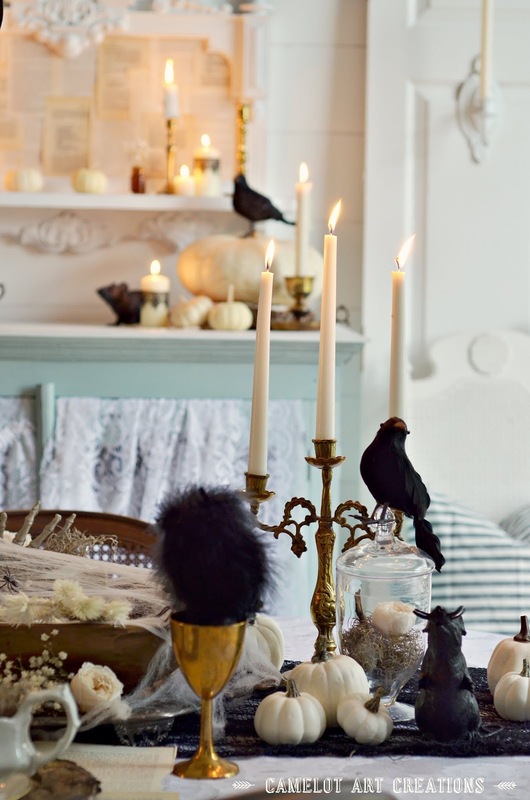 It's funny how candles can be used to add elegance, warmth and spookiness all at the same time. I used a few different sizes and scattered them around adding some decorative lace to some of them. I didn't do too much for the plate settings. 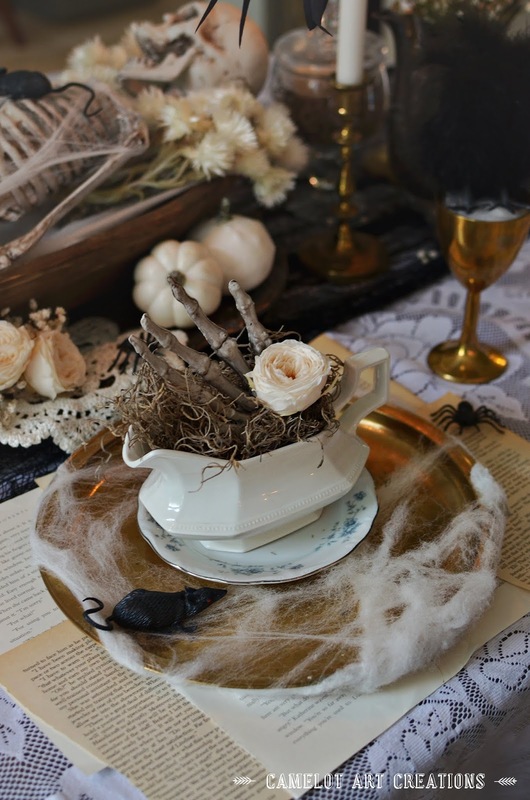 I wanted the antique dishes to be the statement pieces using some of my ironstone gravy boats and added that touch of creepy with the bone hand for supper! I've been telling myself less is more lately! To tie in with the book page front mirror I did book page placemats. Free! 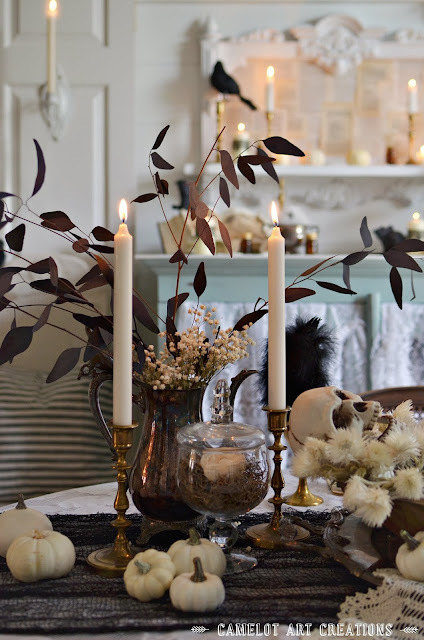 I had some dark Merlot Eucalyptus stems from my Fall Tablesetting HERE and used them mixed with dried babies breath in my husband's grandmother's silver pitcher. I love the loose sprawling look of them! 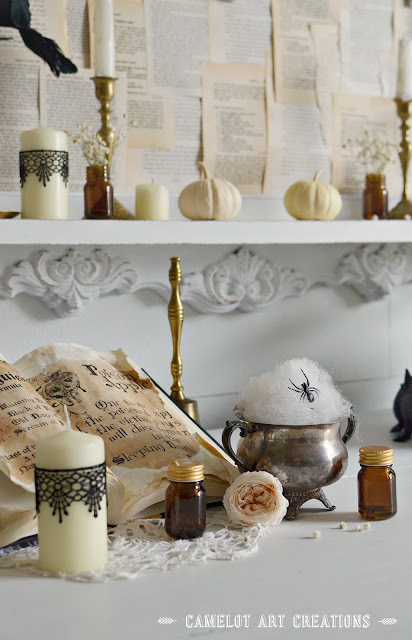 A few years back I made that tea stained spell book, you can find the tutorial HERE! I picked up that shabby mirror recently for $10 on FB marketplace and it looked like wood in the pictures. It turned out to be plastic but I still loved all the details on it and it has texture in it like real wood. I painted it white and distressed it, it's perfect for Halloween and I'll use it through Christmas. After the new year I want to use it in my daughters room.....but the reflection in the mirror is my husbands not so pretty office so I covered it with book pages. 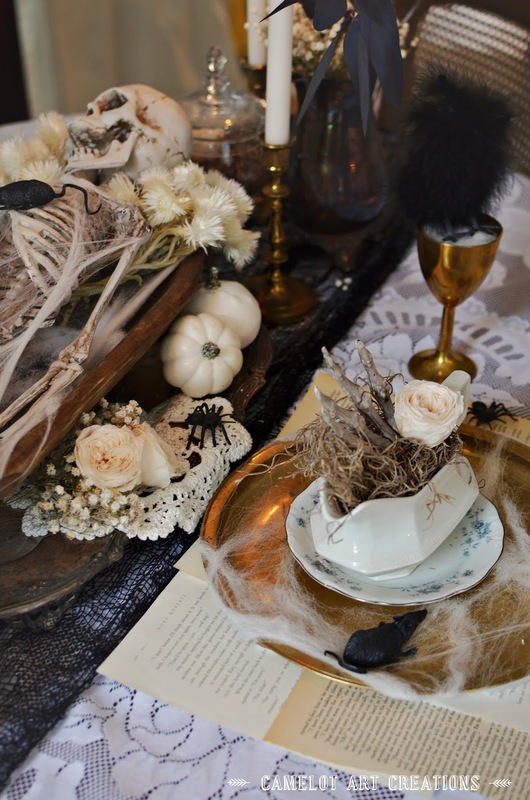 Hope you've enjoyed this elegant and creepy tablesetting I've shared and that you'll make your way through the other bloggers in the list below! Such frightful fun! 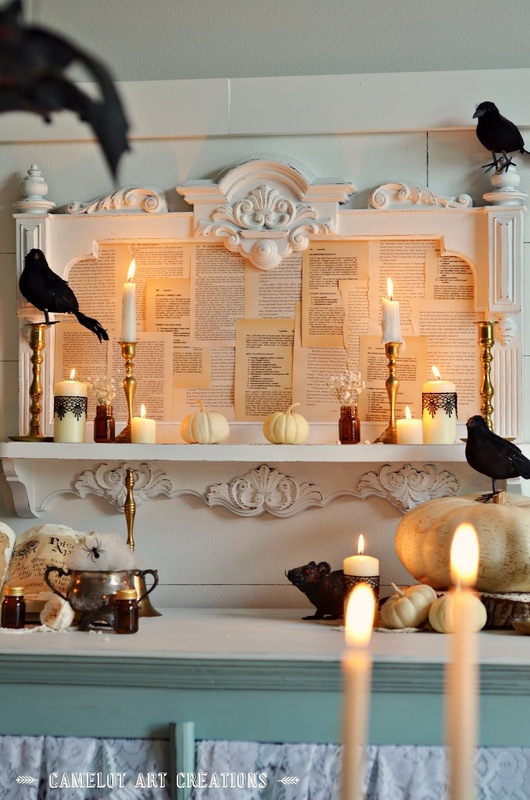 I love the vintage vibe and whole vignette with the mix of book pages, ironstone and spookie skellie. I love how your skellie landed and fit your the dough bowl as your centerpiece. 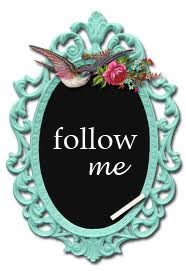 ;-) Fun joining and blog hopping with you this week. Desiree, I absolutely loved it! 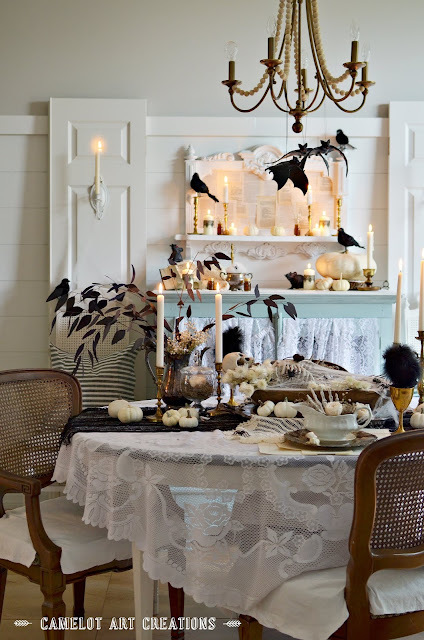 All the vintage elements, lace, mixed with the black bats was wonderful. Wonderful too having your kids help out. A terrific balance of vintage elegance with creepy fun! Yikes, the black and white and tarnished silver is sooo eerie and dramatic! I love that your sons helped you! I'm sure they loved all the scary bats and skulls! Very Spooky!! I love all of your ideas and I especially love how accessible they are for everyone! My favorite elements (of many) are probably your skeleton hand gravy boats and book page placemats - brilliant! That spell book is super cute, too! So fun hopping with you! Always fun to blog hop with you. You really did nail putting elegance into a spooky vignette! 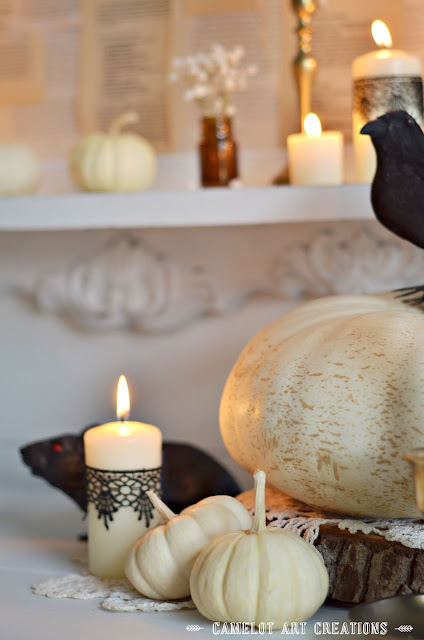 It is simply adorable, and I'm not a huge fan of spooky. 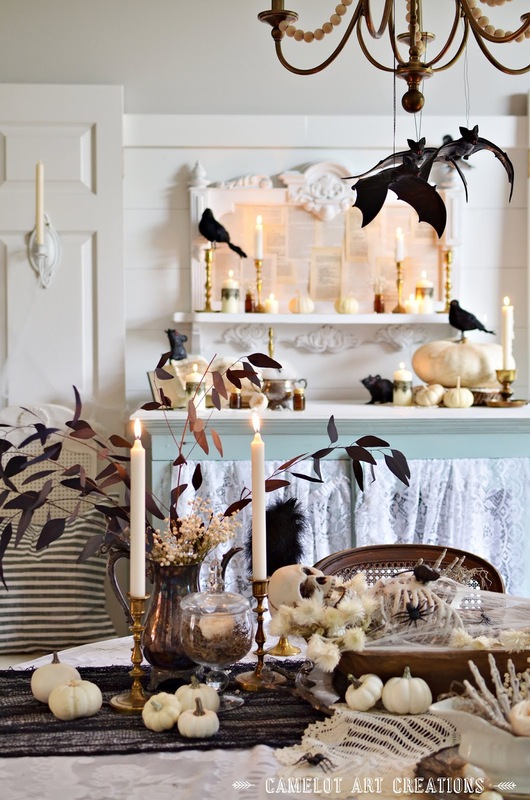 But this makes me want to replicate your look for a dinner! I especially love the book pages. Good job! 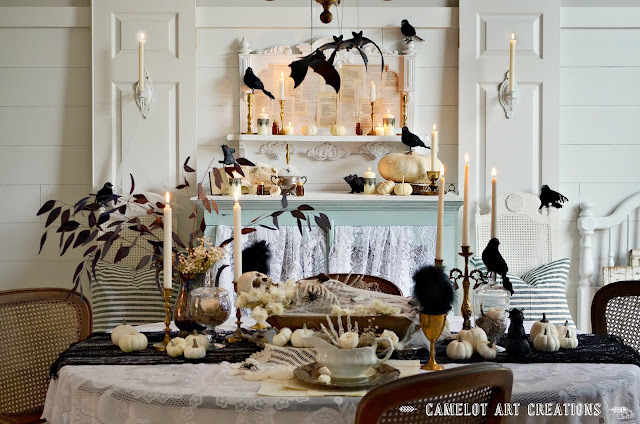 Lovely eerie and spooky and yet elegant table. Love that your son dropped the broken skeleton in your dough bowl. Wonderful look. It's great you used what you had to create this Halloween table. Adding the bats and props make this a wonderful table to celebrate Halloween. Love the black and white. You were not alone using this color theme. 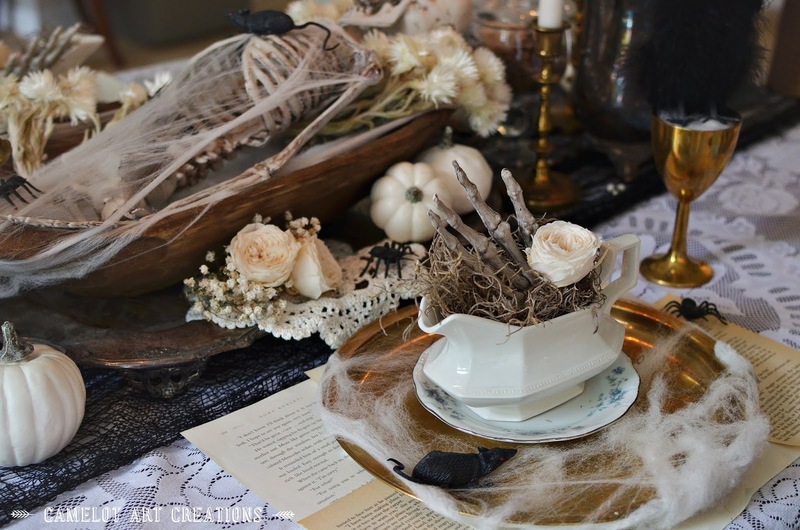 It's been great fun joining you on this Halloween tablescape blog hop. I am totally in love with your tablescape! 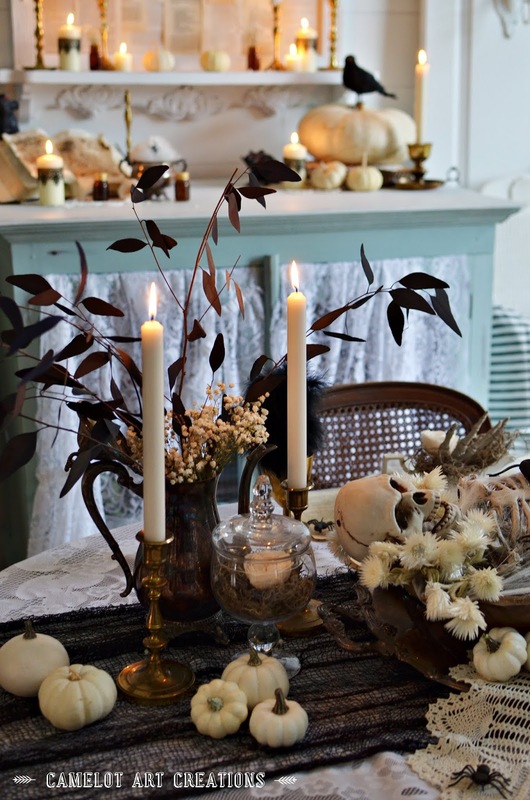 It is the perfect mix of spooky, vintage and floral. 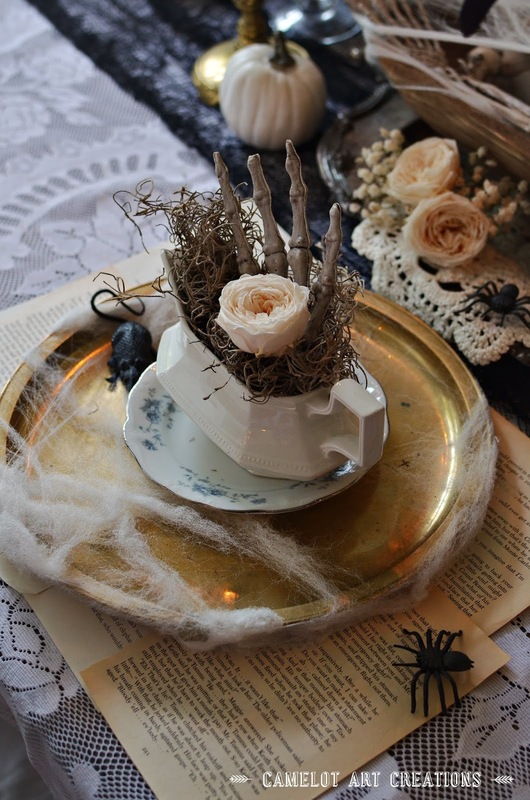 The skeleton dough bowl centerpiece and the skull hands in the tea cups with flower touches is so stinkin' creative! 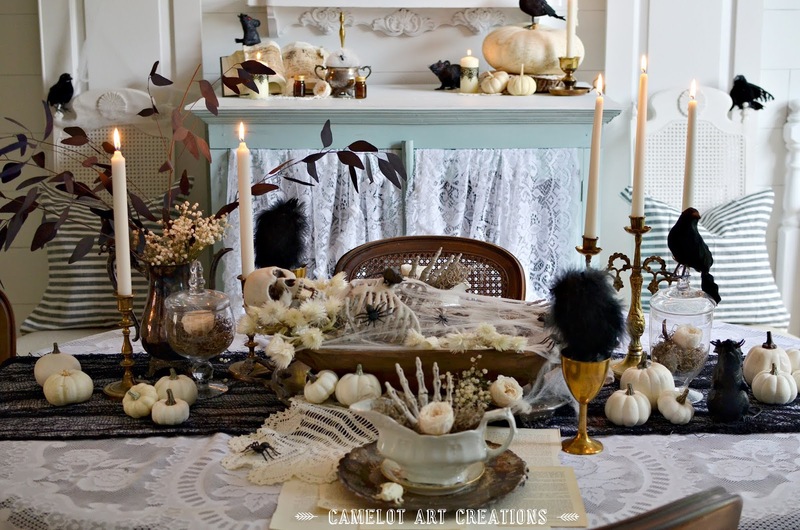 The gorgeous decorated fireplace mantel in the background brings everything together nicely. So happy to be hopping with you! Kinda creepy and very classy! 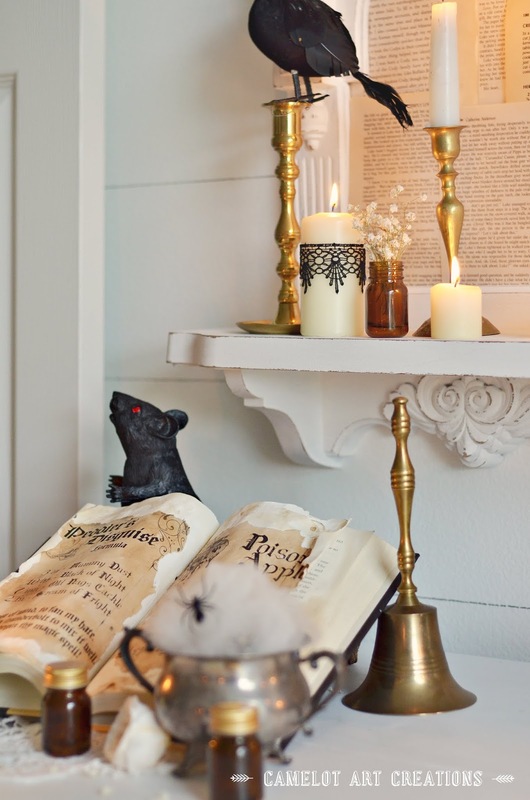 The dough bough is the perfect resting place for Mr. Skeleton and the book pages are just right for place mats. It's been a fun week of hopping and inspiration. Happy Halloween! Quite creepy, and to think it was sparked by what you thought of as just a broken skeleton! Of course you added lace, I remember you had quite a supply of old lace the first time we met! 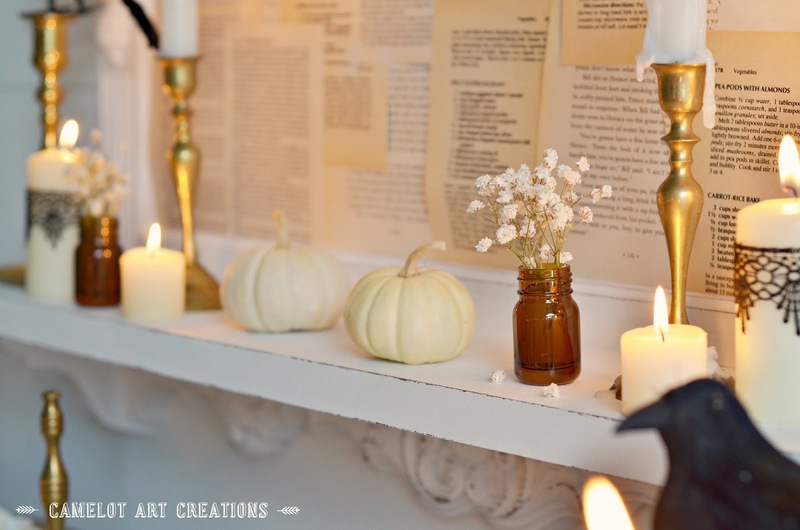 I LOVE the use of the old book pages, both for placemats and in the frame on your mantel! Thanks for sharing your style and joining in another hop! Happy Halloween! Where do I begin! I love everything. 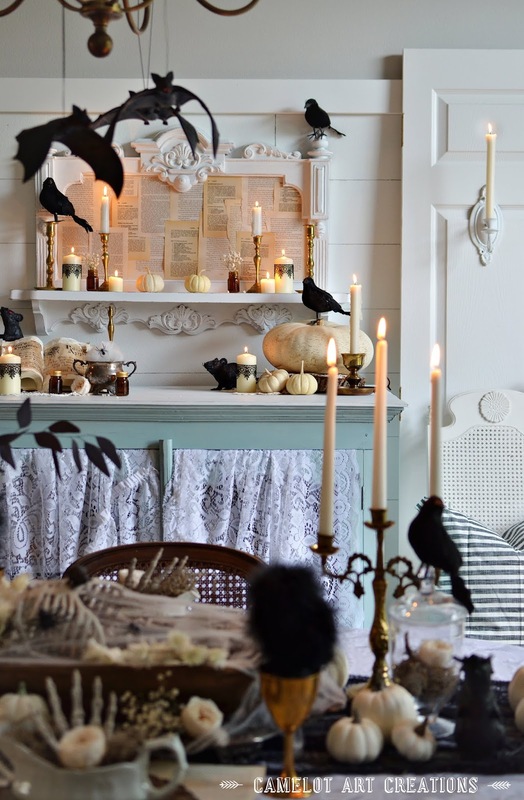 The feathery black stems caught my eye straight away, but then the skeleton centrepiece drew me in. 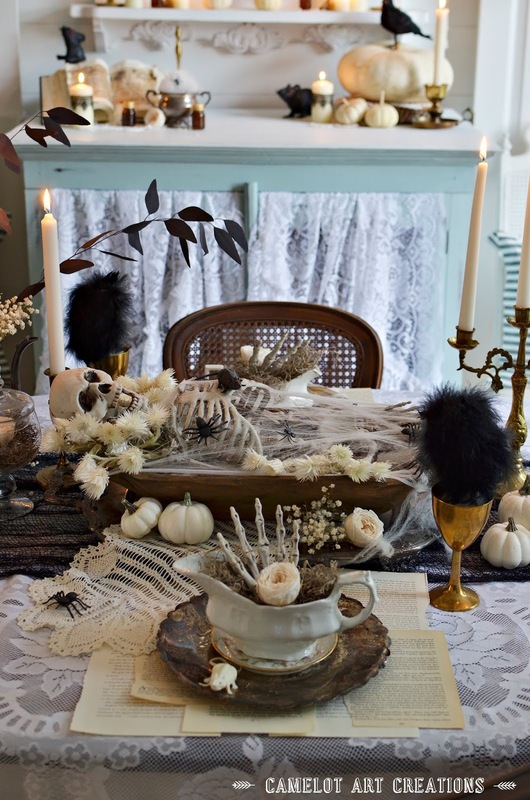 They way you have used the gravy boats with the skeleton hands stick up is so fun! Very creepy indeed! This is really beautiful Desiree. 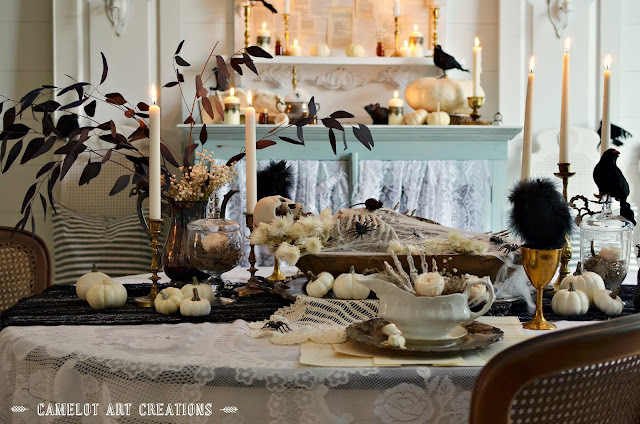 I love the vintage, and antique things combined with the Halloween decor. So well done and put together.